Today I’m sharing with you an easy recipe that you can have on the table in about 35 minutes working at a steady pace. Hear Ye! Hear Ye! I can now announce that I am the new King Zoodles Chef. Mrs. CBB said that I’ve finally mastered the art of zucchini noodles. That or she just wants me to keep cooking so she doesn’t have to. Nah, she meant it. Good-bye pasta. Thanks for many years of tummy filling goodness but we’re moving on to something far different and it’s gluten-free. We are a pasta loving family but in order to keep the carbs low we’ve started removing as much gluten as we can as well sugar but most of all, eating too much food. This Zoodles Bolognese is so good you’ll be telling yourself that it is on the weekly menu forever. Every bite is filled with tonnes of flavours from the spices. A dish like this in a restaurant could easily cost you $20 where I was able to make this entire recipe that serves 4-6 people for that same amount. This is just an example of why it’s important to do your cooking at home and save money for other adventures and life experiences. Unless of course is your life experience but then I can’t help you then. You still should try this Zoodles Bolognese recipe anyways. Not the stuff you buy in a can… not even close. Zoodles are made using a fresh organic (if possible) zucchini and then spiral sliced using various methods such as using a mandolin or even a vegetable peeler. The big Zoodles low-carb keto diet rage has brought together a delicious menu of foods that most people would pass up since we’ve been conditioned to believe that fats are bad for our body. That’s not the case. There are plenty of successful Keto lifestyle bloggers who have documented their successful journey eating foods they have come to love and make at home. The best part is that eating out can be challenging and costly which means cooking and eating-in becomes appealing. Less time in the restaurants the more money you will save. 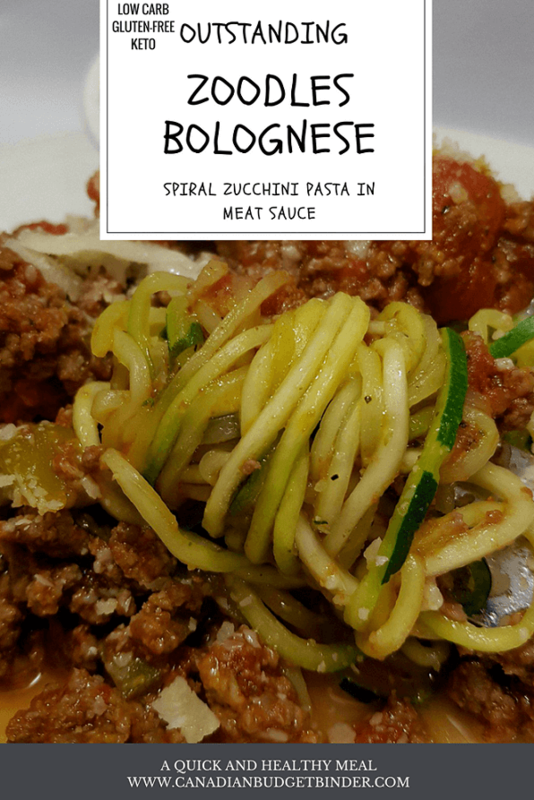 Some of the names you will find popular zucchini dishes such as this Zucchini Bolognese vary from recipe to recipe but all mean the same thing using the same ingredient. You guessed it, Zucchini. 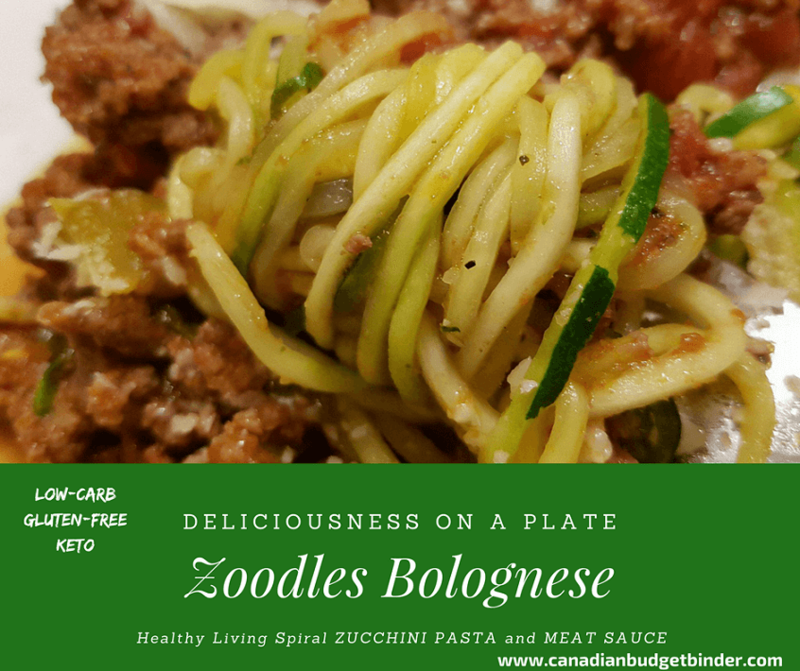 We’ve made Zoodles using 3 methods over the past two years of eating Keto which is a low-carb-high-fat (LCHF) diet based around the Atkins diet. The premise is that eating fat makes you thin but it must be the right fats and less carbs, way less. It’s amazing what we’ve learned about gluten-free food and just how many carbs you’ll find in the foods we eat. If we don’t burn these carbs off they turn to sugar and eventually body fat. Zucchini has approx 3.7 net carbs for a small-sized zucchini. Not too shabby at all! Eat too much protein and the same thing can happen. Eat more fat then protein and carbs, drink lots of water (everyone should) and moderate exercise and you’ll see your weight shift lower. At least that’s the idea and what Mrs. CBB has had happen since starting this lifestyle. Low Carb is not a fad diet it’s a lifestyle and a delicious one at that. You can also find a Spiral attachment for your Kitchen-Aid mixer if you’re willing to spend a bit more money. We have a mixer but went the Star-Frit spiral Tool route after attempts with method 2 and 3 above. When it comes to cooking Zoodles we prefer to spiral the zucchini thin so it heats up faster in the frying pan. Since zucchini consists of over 90% water so be mindful how much water your zucchini will expel when you boil, saute or bake. Some people like to boil the spiral Zoodles for 1-2 minutes, drain and then squeeze gently in a cheesecloth. I’m not a huge fan of this method as I find the Zoodles become mushy. Keeping it simple is my motto especially since time is important to us as parents. A healthy zucchini recipe starts with choosing the right ingredients to fit your lifestyle. One of our all-time favourite Zoodles is a quick zucchini pasta Bolognese. What you’ll get with this outstanding dish is a Al-dente zucchini noodles stir-fried in a bit of butter or avocado oil and garlic then topped with a homemade chunky meat sauce. To finish it off before devouring the entire plate adding freshly grated Parmigiano (Parmesan) over the Zoodles. Call me a bit nutty but on the side I like to have a small pot of full-fat mayonnaise to add for a burst of cool flavour. You don’t have to do this because it’s more specific to my taste-buds but certainly give it a try. We used Hellman’s mayo as that is what we have in the house or if you have some time homemade mayonnaise is the bomb. 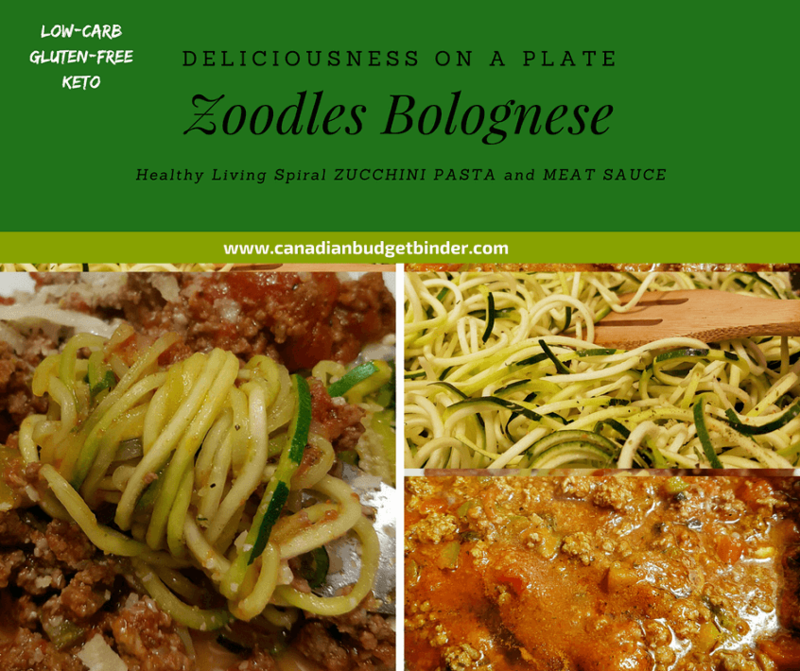 Zoodles a.k.a Zucchini pasta is a huge hit in our family and a great way to chop lots of gluten from a pasta heavy diet. 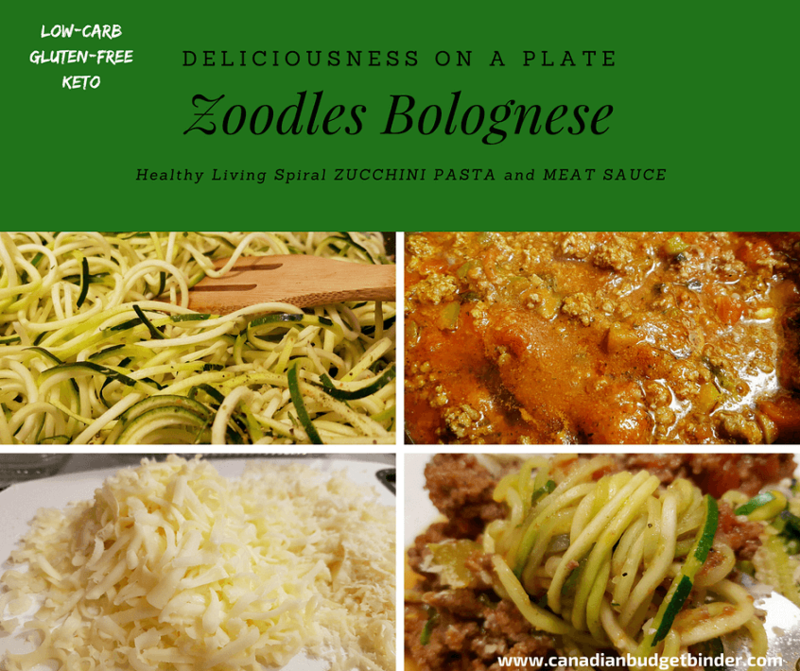 You can add whatever you like to your zoodles meaning vegetarians and vegans can love zucchini pasta and salad dishes too. 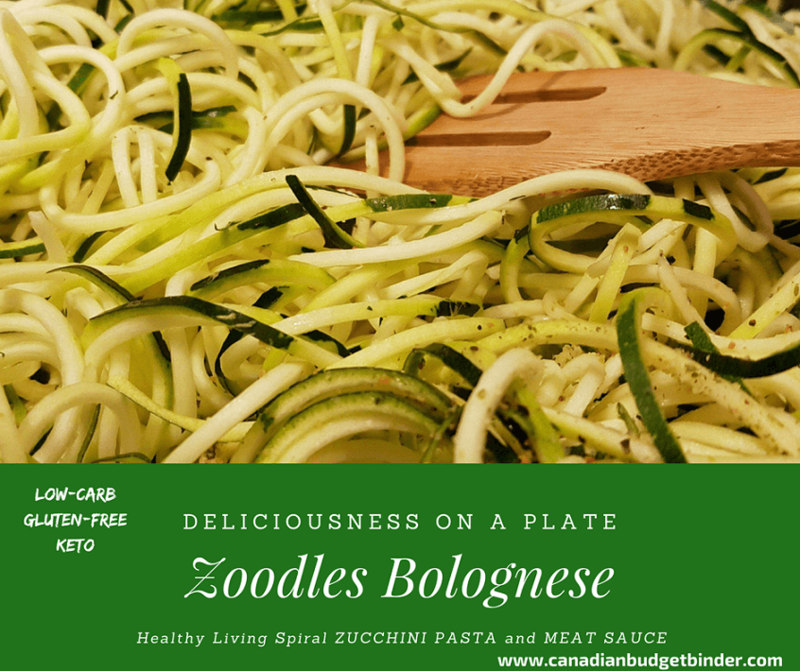 Using a spiralizer you can make your zoodles ahead of time and set in the refrigerator in a bowl with paper towel underneath and on top to soak up moisture while you get your sauce going. If you find the strands of Zoodles too long chop them with scissors as you go along. Add 2 cans of whole tomatoes which you can chop ahead of time or using scissors you can chop them right in the pot as you stir. After 15 minutes of your sauce cooking in the pot you can begin the zoodles in a large frying pan with butter or oil, garlic and seasonings. I tend to stir often to keep the time process moving. The zoodles will be done in about 3-4 minutes on medium-high heat stirred often. Add what you'd like to your dish keeping as much water away as you can. You can also drain the pasta if you want but you'd lose lots of the amazing flavours. Top with your chunky beef pasta sauce and cheese and start eating. If you’d like to keep your Zoodles vegetarian forget the beef and add a dairy-free cheese on top or add to salads and soups. We love chicken Zoodle soup, tomato Zoodle soup and so on. Once you have the art of cooking zucchini noodles down you can add just about any flavours you want to them. Another really cool idea to ponder is using spiral zucchini Zoodles as a cold salad with dressing or put into a salad to jazz up the veg count. Delicious!!! Discussion Question: What is your favourite type of Zoodles pasta? Leave me a comment below and I’ll respond shortly.